Sunday is slowly coming to an end. We hosted 7 Attack of the Giant Cards Events in total. Here are the winners of Sunday! How do you feel right now? I’m really happy, because the Deck is really good and I wanted to have a good result. The Main Event didn’t go too well for me and I wanted to redeem myself and take home a good result. What Deck did play today? Gouki, it was the same list as in the Main Event. I made a few changes in my Side Deck, because I was expecting different Match-Ups for the Attack if the Giant Card. Any last words? Tanks to all of my friends that support me from home and here in Berlin, in particular Lorenzo Santoni, Andrea Rossi, Francesco Bonafede. How do you feel right now? I’m really excited, it’s my first big prize even though I’m no stranger to big events. I topped last year’s WCQ! What Deck did play today? 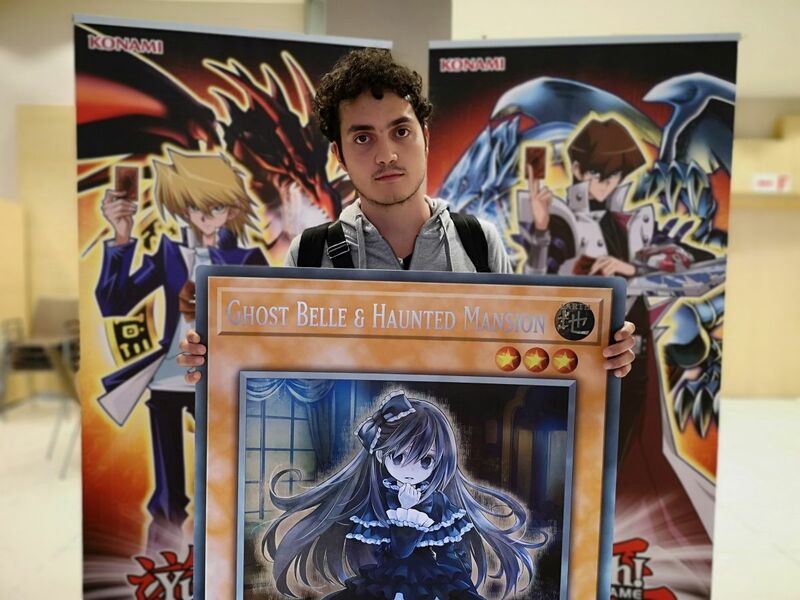 I entered the Giant Attack of the Giant Card, because I really enjoy to play Structure Deck events. It is really challenging, because on the one hand you are not familiar with the metagame and on the other hand you almost have perfect information. You know all the cards that you opponent has available. How do you feel about the Giant Card events? I really and think they should be continued at all cost. They are nice prize that is only available at these events. Any last words? Shoutouts to my friends here at the venue. Thanks for rooting for me in the final. How do you feel right now? I’m happy standing here talking to you. After the Main Event didn’t go all too well for me, I’m happy I had the chance to take home a nice prize and great memories. How do you feel about the Giant Card events? They are a great addition to the whole Yu-Gi-Oh! experience. Any last words? Thanks for the interview and the great experience in Berlin. How do you feel right now? Fantastic, very happy, but very surprised. I didn’t think I was going to win. What Deck did play today? Trickstar Sky Striker, I changed the Deck completely after not doing so well in the Main Event. I put more emphasis on building a consistent Deck than adding too many tech cards. 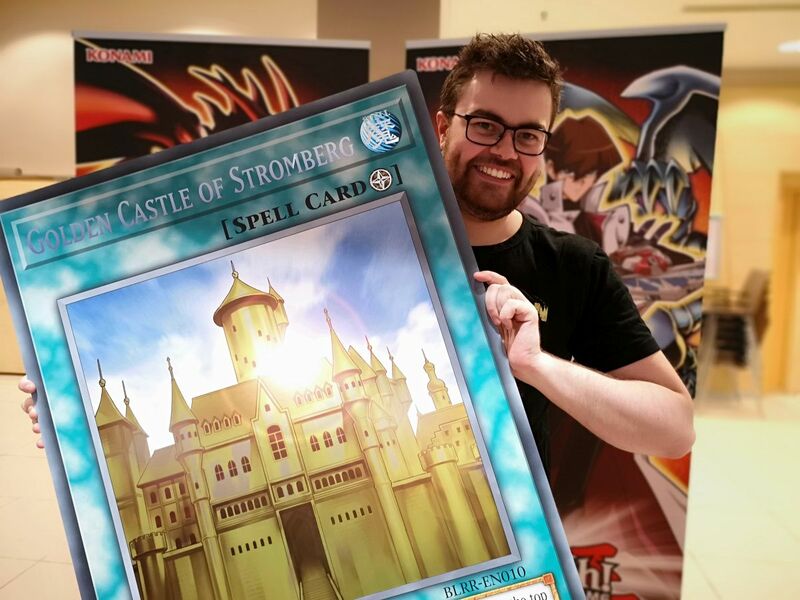 How do you feel about the Giant Card events? I think they are a fantastic chance to win something different. And now since they have the holographic effect they are even more beautiful. Any last words? Thanks to all my friends that helped me test and lent me cards for the Deck, because otherwise I wouldn’t have been able to play the Deck. How do you feel right now? I feel pretty good now that I won the Giant Card. It didn’t go so well in the Main Event for me. 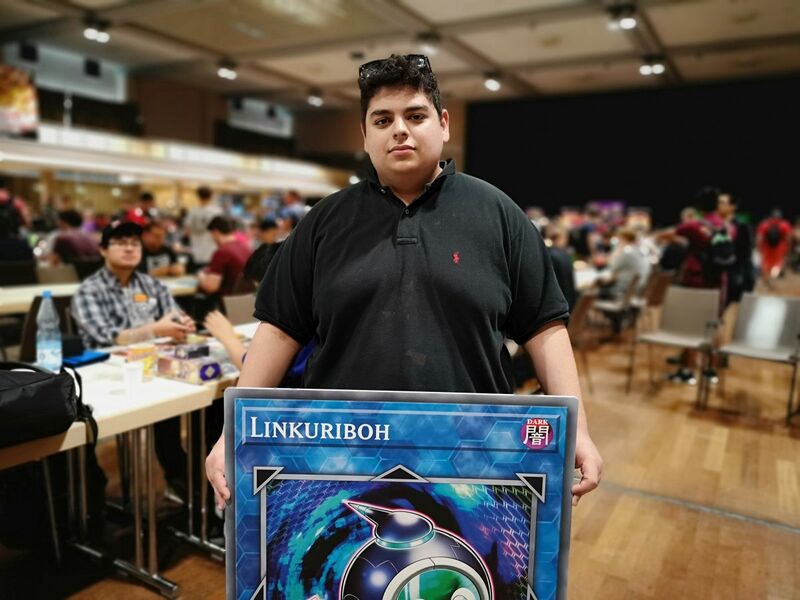 I’m pretty happy that I was able to bounce back and win the Giant Card. What Deck did play today? 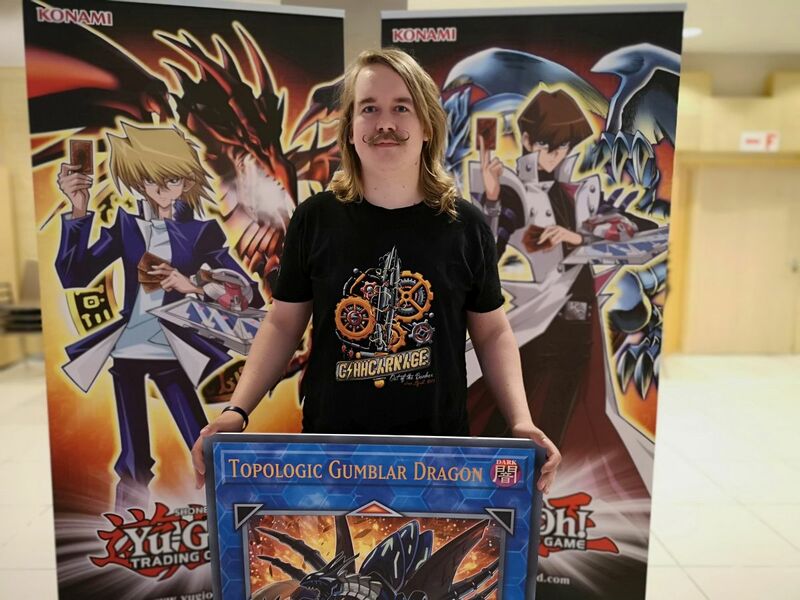 Gouki with Topologic Gumblar Dragon in the Extra Deck. That’s why I wanted to win this particular card. Gouki has a favourable Match Up against Trickstar. I thought it would be best to run a Deck that has a favourable Match-Up against the most popular Deck. How do you feel about the Giant Card events? I think it is a good idea. 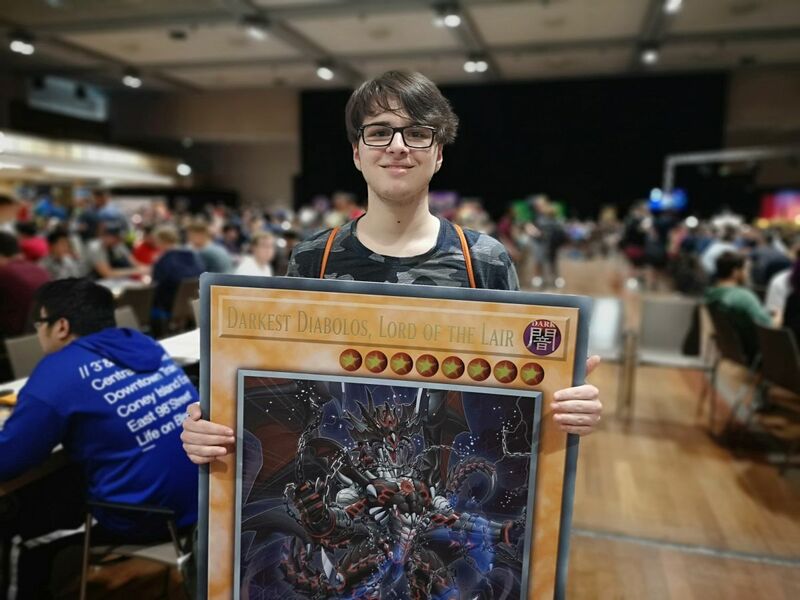 It is nice to have a Giant Card of your favourite card at home to show to people. It gives a lot of sentimental value to the events you go to. Any last words? Shoutouts to my girlfriend for supporting me. She really wanted the first Giant Card, but this one was her second best choice. Also shoutouts to the people from Denmark I came here with: Jakob, Daniel, Bo, Michael and to Kris for topping the Main Event.